The 5th Annual RECOMB Satellite on Regulatory Genomics, the 4th Annual RECOMB Satellite on Systems Biology, and the 3rd Annual DREAM reverse engineering challenges were held jointly at MIT on Oct 29-Nov 2, 2008. 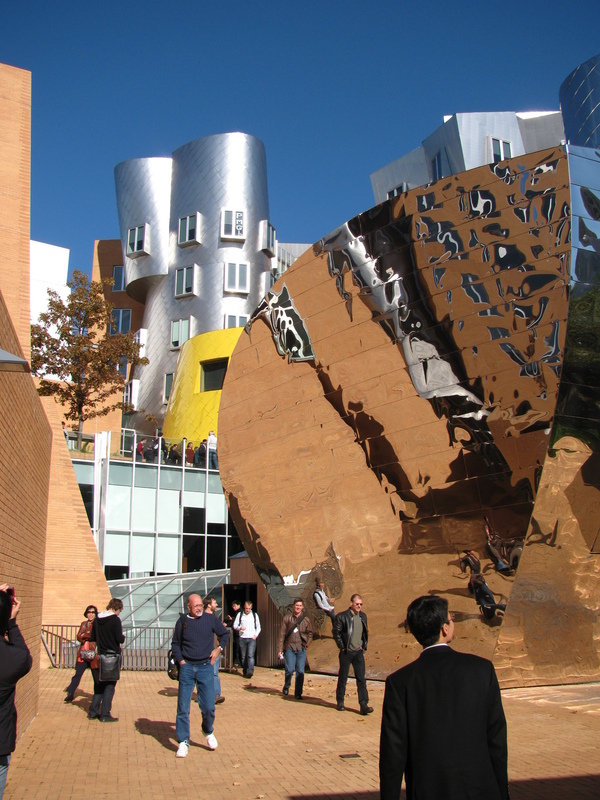 The meeting was jointly organized by the Broad Institute of MIT and Harvard, and the MIT Computer Science and Artificial Intelligence Lab (CSAIL). The meeting started at 5pm on Wednesday October 29, 2008, and ran till 1pm on Sunday November 2nd, 2008. 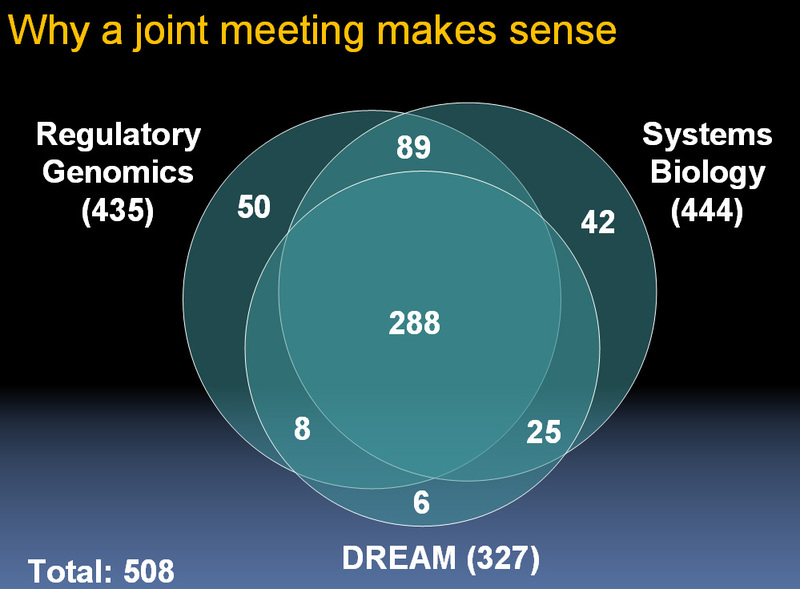 The meeting brought together computational and experimental scientists in the area of regulatory genomics, to discuss current research directions, latest findings, and establish new collaborations towards a systems-level understanding of gene regulation. The meeting consisted of 16 keynote presentations, 93 oral presentations selected from submitted manuscripts and 1-page abstracts, and 160 posters in four poster sessions. More than 500 participants registered attended the joint meeting, of which the vast majority attended all three meetings. Conference Chairs: Manolis Kellis (MIT), Andrea Califano (Colubmia University), Gustavo Stolovitzky (IBM). Organizing Commitee: Eleazar Eskin, Nir Friedman, Leroy Hood, Trey Ideker, Douglas Lauffenburger, Satoru Miyano, Eran Segal, Ron Shamir. Partner journal editors: Hillary Sussman, CSHL (Genome Research), Thomas Lemberger, EMBO (Nature MSB), Sorin Istrail, Brown University (Journal of Computational Biology). The resulting meeting was a resounding success. 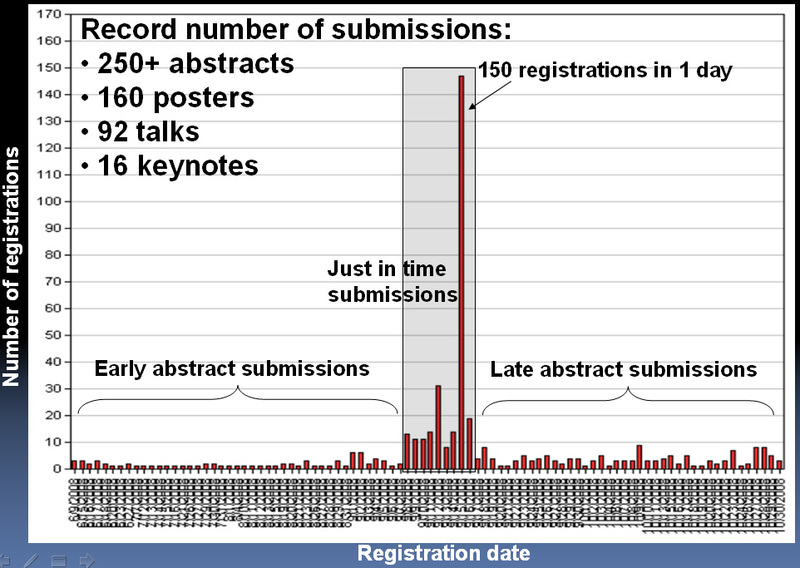 We received 250+ abstracts (ByDate), 50+ paper submissions, and 400+ DREAM Challenge predictions, from some of the best labs in gene regulation and systems biology worldwide. These resulted in a scientific program of outmost quality, with 93 oral presentations, 160 posters, and 24 accepted papers in the three partner journals. The conference was truly international this year, with 103 participants from 24 countries, including 15 from Asia, 17 from Israel, and 59 from Europe. The broader US was also well represented, with 185 participants flying in from all corners of the US. 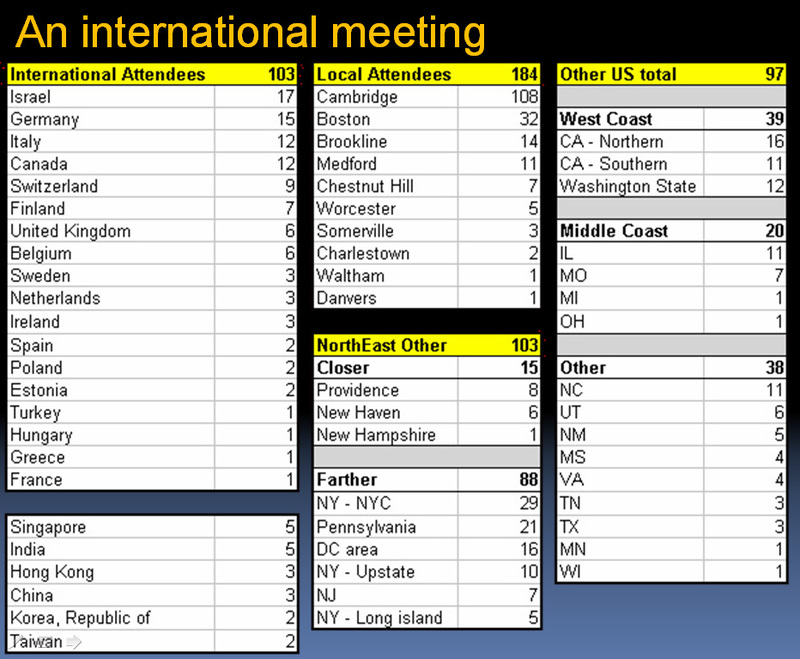 Local participation was also high, with 184 attendees from the Larger Boston Area (including 108 from Cambridge), and an additional 15 commuting from Providence, New Haven, and New Hampshire. (ByCountry). Modeling and recognition of regulatory motifs and modules. Chromatin state establishment, maintenance, and role in development. Post-transcriptional regulation and small regulatory RNAs. Regulatory networks, metabolic networks, proteomic networks. Cellular signatures of biological responses and disease states. Phosphorylation, metabolic fluxes, systematic phenotyping. Mathematical modeling and simulation of biological systems. Pathway inference and reverse engineering of cellular networks. Fill in your abstract title, authors, affiliation, text. Edit your conference choice and oral/poster preference (in the document header). Upload the abstract during registration of the presenting author at regonline.com/recombsat08. Abstracts submitted until Sept 15 will be considered for oral platform presentations and also poster presentations. Accepted abstracts will be included in an abstract book to be distributed to all conference participants, also including abstracts of full-length papers accepted in our partner journals Genome Research, Nature MSB, and J. of Computational Biology. Late abstracts will be considered at the discretion of the conference chairs only, and only for poster presentations. Abstracts sent after Oct 1st will not be included in the abstract book due to printing constraints. All submitted abstracts that are not associated with a submitted paper will be treated as personal communication, and the authors will reserve the right to publish their work elsewhere. In addition to the presentations at the meeting and the abstract book, full-length original papers will be presented at the conference, and published in parallel in leading scientific journals. 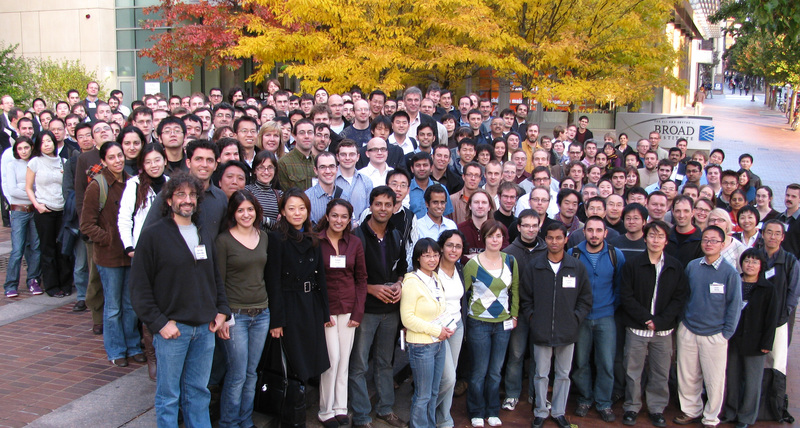 We have partnered with two leading journals in the field of Systems Biology and Regulatory Genomics to offer publication of a select number of papers: Genome Research and Nature Molecular Systems Biology will review a subset of the submitted papers, to be presented at the conference, and published in the partner journals by December 2008. All submitted manuscripts will be reviewed by the program committee, and accepted papers will be presented at the conference. These papers will be published by the Journal of Computational Biology in a special issue containing the conference proceedings. This review will happen in parallel with the two partner journals, and only papers that do not appear in another journal will be included in the proceedings. Option 1: Submit a 1-page abstract. These will be used to select short talks for oral presentations and posters. Please use the provided One-page abstract template. Deadline: Sept 15, 2008. Instructions: All manuscripts should be submitted via the EasyChair system and not directly to the journal websites. Length limits are 30,000 characters without counting spaces (which is ~14 pages of double-spaced 11-pt text), 5 display items (figures or tables) totaling no more than 2 pages, up to 50 references (not included in the word count), and a 250-word abstract. Formatting guidelines vary depending on the partner journal selected by the authors (see GR format, Nature MSB format, JCB format). Deadline: Aug 1, 2008. Process Overview: Manuscripts will be reviewed by the program committee, and will be part of the conference proceedings published by JCB. A subset of selected papers will also be reviewed in parallel by our partner journals Genome Research and Nature Molecular Systems Biology. All accepted papers will be presented orally at the conference, and will appear in press by our partner journals before the end of 2008. More details below. Participants to the DREAM3 competition will be presenting their challenge responses at the conference. You can download the DREAM3 challenges from the DREAM Project website. Deadline: Sept 15, 2008. Aug 1st (11:59pm US Pacific Time): Papers should be submitted via the EasyChair System (if you do not already have an EasyChair account, please login to set one up). During submission, please specify whether you are interested to be considered for joint review with Genome Research or Nature MSB, and your first choice preference. 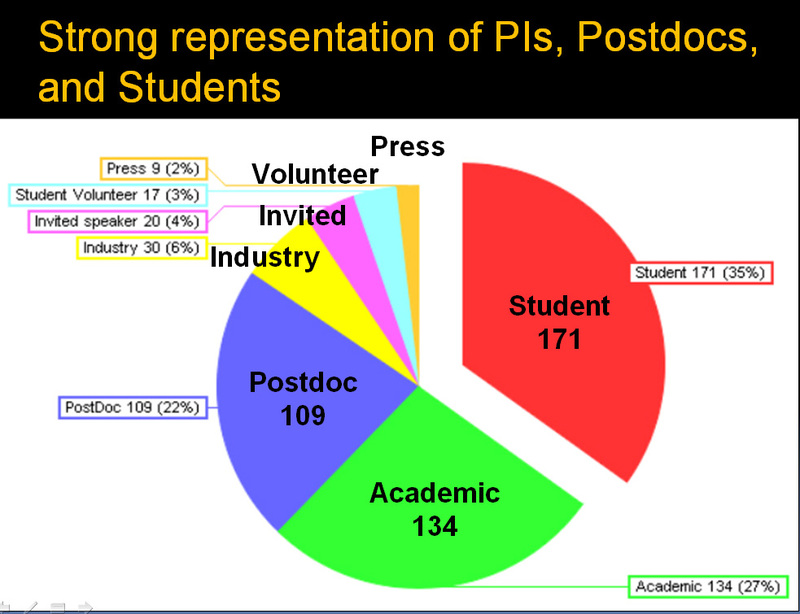 Please also specify which conference your paper should be reviewed for, as each has a different program committee. ~Aug 5th: Papers are assigned to partner journals and authors are notified of the decision. Papers are also assigned to program committee members by the area chairs. ~September 1st: Initial notification to authors about the review process. Accepted papers and papers requiring modifications get to reformat their papers. ~September 30: Revised papers submitted to the appropriate journals. ~October 20: Final decisions made and communicated to the authors. Oct 29-Nov 2nd: Accepted papers are presented at the meeting, and their abstracts are published as part of the printed conference booklet. Papers are available electronically to the conference attendees. Dec 2008: Papers are published online or in press by the partner journals and proceedings issue appears in JCB. 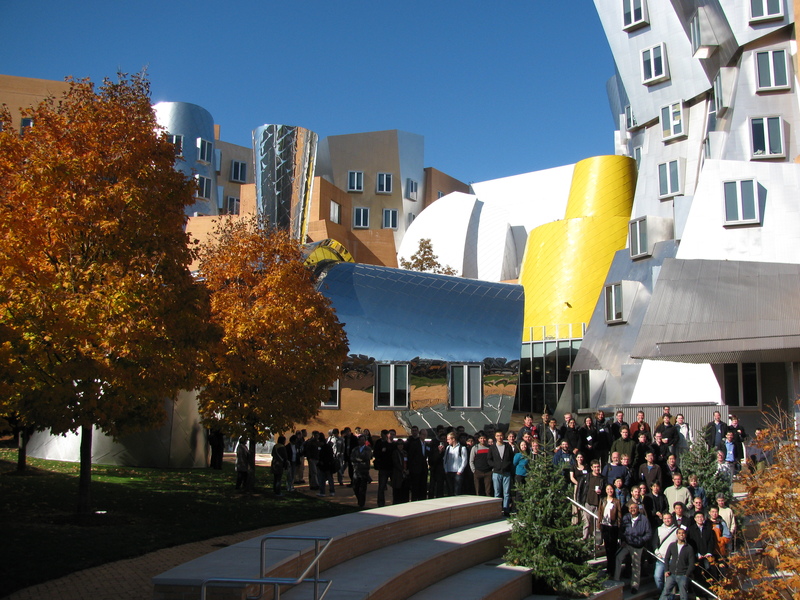 MIT is located in Cambridge MA near the waterfront of the Charles River, overlooking downtown Boston. The conference will be at the corner of Main Street and Vassar St, the new biotech corner of MIT, at the Broad Institute Auditorium and all poster sessions will be held in the Broad Institute Lobby and Museum Space, outside the Auditorium. Several local hotels have offered us conference rates, valid until Oct 1st. We are also offering the option to share the room cost (split in 2) with a roommate. Just sign up for that option when registering on the website, and we will take care of contacting the hotels for you. For any hotel-related questions, please contact Monica Concepction at mconcep@broad.mit.edu or 617-324-5019. Parking for the conference can be found in one of four parking lots, open 24 hours, with rates: 1 hour $8, 1-3 hours $15, 3-24 hours $20. (5) East lot, Outdoors, across from the Broad Institute.